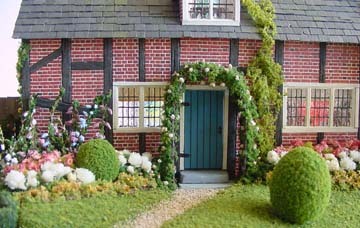 The English Cottage was my first "big" 1:48 scale project. The cottage was designed by Pamela Junk. 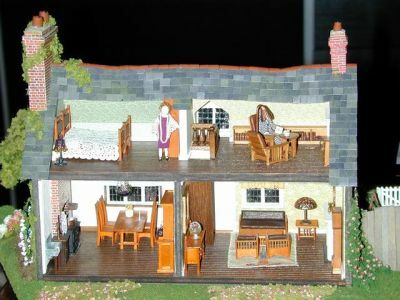 Her project instructions appeared in Nutshell News (now Dollhouse Miniatures) in April and May 1993, followed by landscaping instructions by Karen Marsh in the June and July issues. Most of the furniture in the house is based on Madelyn Cook's 1:48 scale Arts and Crafts furniture projects in Nutshell News in 1996-1997. I want to take new photos of this house, for better quality, but as it is I can't photograph the garden - the natural plant materials I've used have aged very poorly. You could say the garden needs renovating! When I started on this house, I had already built some Arts and Crafts furniture from Madelyn Cook's designs in Nutshell News, that I wanted a setting for. I decided that this was the country retreat of a 1920's couple, who had brought a lot of their Arts and Crafts furniture there. The house is electrified - each room has a working lamp. You may notice that I made a mistake in assembling the house. The small chimney with a single chimney pot should go be on the kitchen's side of the house, and the big chimney with two chimney pots should go on the other side, where there are two fireplaces. 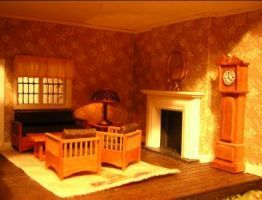 I based the clock on a 1:12 scale Georgian design in Dolls' House World (1989). The rest of the furniture is based on Madelyn Cook's instructions, and the carpet is also her design. The slatted detailing on the furniture is actually plastic railing intended for model railroads. I think I based the kitchen dresser on a traditional design (1:12 scale) in Nutshell News, but changed the trim slightly in an attempt to make the style more like Arts and Crafts. The plates on the kitchen dresser are polymer clay, made according to Lyn Latimer's instructions in Little Enough News volume 2, issue 2. I painted them with a design inspired by some paper cut-outs in an old issue of Dolls' House World . The sink and pump are copied from a 19th century kitchen in a book on renovating English houses. The towel is a piece of fabric - soaked in FrayCheck, arranged in folds, and glued in place when dry. The dining table and chairs are some more Madelyn Cook designs. 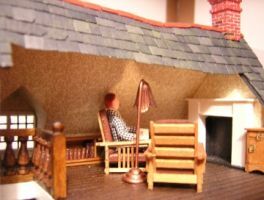 The beds are based on a photo of 1:12 Stickley style bed in Miniature Collector. I built a wardrobe and chest of drawers too, I think I based them on some photos as well. 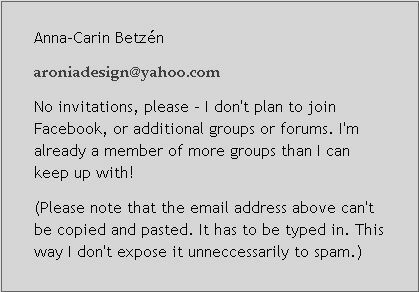 The crocheted bedspread is my own design, using cotton sewing thread. The how-to is in the DIY projects section. I crocheted the woman's shawl too. The Morris style chairs, tea table and smoking stand are built from 1:12 scale Stickley designs in Nutshell News (October 1991). 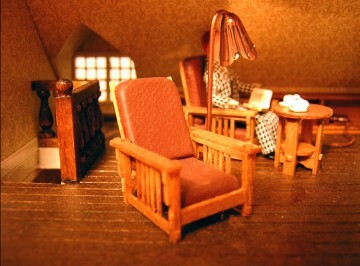 My instructions for the Art Nouveau reading lamp in the library were published in LEN volume 4, issue 5. The Morris chair is all wood. The full-scale chair had an adjustable reclining seat back, but to me that's not an option in this scale! Karen Marsh used a lot of dried flowers and dried greenery in her landscaping directions, but I couldn't find the same species locally so I used what I could get. Afterwards, I've noticed that the dried plants I used didn't hold up very well (they've been very fragile, and many have turned brown in just a few years time). 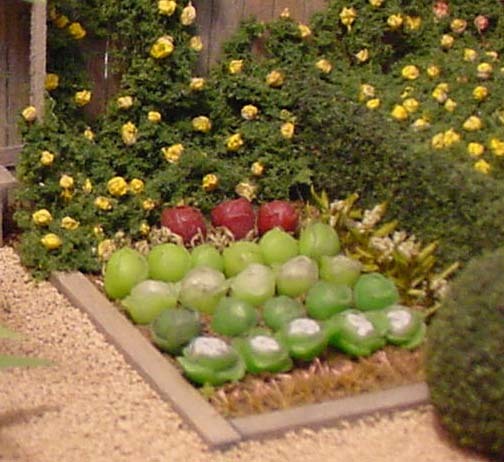 For future projects, I've decided to avoid using natural flowers and leaves in miniature projects, with one exception - painted flowers! The sunflowers are made from dried flowers that I painted, and these still look as good as new. The coat of paint has given them additional strength, so they're not as fragile as the others. 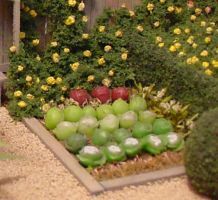 The model railroad landscaping products I used for grass, topiaries, hedges and foliage have worked very well (Woodland Scenics' ground foam and foliage). The cabbages too - I made mine from polymer clay.